Where are you located? We are located in the beautiful Blue Ridge mountains of Western North Carolina. 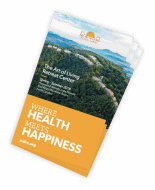 Our physical address is 639 Whispering Hills Road Boone, NC 28607. We are two hours Northwest of Charlotte. Is your property pet-friendly? Our facility does not house pets. However, we can recommend some nearby kennels to keep your furry friend close. Can I stay at your property if I’m not taking part in a retreat? Absolutely! Guests always have the option to reserve a room and simply choose meals, activities and spa treatments as they please. To reserve a room please click here. Do you have retreats with flexible dates? Yes. We offer spa retreats with flexible dates that allow guests to sample a lot of what we have to offer but at bundled rates. To see the spa retreats we offer, please follow this link. I understand that your property is meat-free, alcohol-free and smoke-free, can you please elaborate? To encourage a healthy environment we ask that guest to not consume alcohol or meat in our public spaces, however guests may enjoy these items in their rooms. That being said our property is always smoke-free. Do you have A/C? No, due to the cool climate of the Blue Ridge mountains we have found that A/C is not needed. All rooms are equipped with ceiling fans and box fans just in case. Does your property allow children? Yes, we are a family friendly property. We offer rooms that can comfortably accommodate families as well as family fun activities on-site such as hiking trails, pottery classes and even a children’s playground. Children must be supervised by an adult or guardian at all times. How far away are you from Appalachian State University? Downtown Boone? Ski slopes? We are a short 15 minute drive to ASU’s campus as well as downtown Boone. Most ski slopes are about 40 minutes away from our property. I have food allergies, can I still eat there? Yes, we ask that guests with food allergies simply inform us so we can communicate those needs to our chef. Typically we label potential allergens such as gluten, dairy and nuts. What is your cancellation policy? For room reservations & spa retreats, we have a 24 hour cancellation policy. For all other retreats, please be sure to check the registration page specific to that retreat. Do you offer AAA, AARP or military discounts? Not at this time. Are all of your retreats residential, or can I stay off-site? All of our programs are residential, we have found that this deepens participants retreat experiences. We do permit locals to stay “off-site”, we’d just require proof of residency, please call us to reserve this way. Is your property open to guests only? We welcome everyone, even if you’re not a guest here! We offer daily property tours, meals, pottery classes and much more for visitors to enjoy. To see a list of activities with times and prices please look over our daily schedule. Do you offer gift certificates? Yes, you can purchase gift certificates through our Spa at (828)264.8382. Certificates can be applied to spa services or spa retreats.